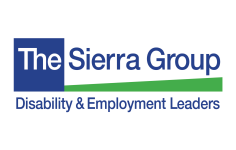 The Sierra Group's Disability Recruiter Certification© Program combines our 25-year history as leading experts in all areas of disability and employment practices for business with hands-on 'skills', as we teach and deploy certified recruiters who can appropriately hire from this diverse candidate pool. This Certification process takes our knowledge base and transfers it to actual skill-building for recruiters that need to interact with candidates with disabilities. Q: How many modules are there? What do they cover? A: Eight online modules full of resources, videos, and skill building exercises take you from unsure to confident about finding, accommodating, and including workers with disabilities, including veterans. Q: Who do you train and certify? A: This program is for professionals involved in every level of the hiring, accommodation, and onboarding process. Q: When do the training modules start? Q: What are the benefits of certification? A: Certification is based on the Sierra Group’s award-winning, over 25 year history of experience in disability employment policy and procedure for business. As such, earning your Disability Recruiter Certification™ communicates your expertise to employers, job prospects, and others involved in the recruiting process. Q: How do I access the certification modules? A: The certification modules are video and audio based with handouts suitable for downloading. They are available online and on demand through a computer, or on-the-go via your smartphone or tablet device. The modules are compatible with Windows and Android and iOS mobile operating systems. Q: What if I don’t pass the tests my first try? A: Should you not pass the criteria for certification, you have one year to continue to review the materials and retake the certification course requirements once you take your first certification exam class. After a year, your progress will not be valid for future classes and you will be required to start over again. Q: What’s involved in the Practicum? A: Practicums are assigned exercises that require you to do the actual work of a disability recruiter. They have a threefold aim: to get you acquainted with the unique processes of disability recruiting, to give you a chance to build skills not just increase learning, and to provide you with valuable resources you will use over and over again. Q: What if I am struggling with some of the concepts during training? A: We don’t think it is likely, but if you do, we are here to help you. With registration you will be given information about The Sierra Group. We are only a phone call or an email away. Q: What do you do with my personal information? A: We collect your personal information – including your name, address, and email address when you register. We use this information to track, verify, and inform you of your status. We do not share or sell any of your personal contact information. Disability Recruiter Certification© is a program of The Sierra Group. ©The Sierra Group Disability & Employment Leaders 2017. All Rights Reserved.